I’d love to hear from you. Let me know what you think about my book, my website, useful links that would help other pet lovers, and other information that you’d like to share with me and other pet lovers who visit my website. If you have general questions about pet health I’ll try my very best to get back to you with an answer. Unfortunately, because of the huge number of questions I get every day, I might not be able to respond to you directly. 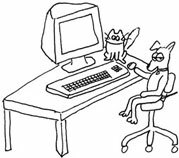 Please note that I cannot diagnose or prescribe treatments or medication for your pet online, nor should any qualified and ethical vet offer to do so. If you feel that your pet requires immediate medical care, please take them to your vet.